Stand tall in the woods. 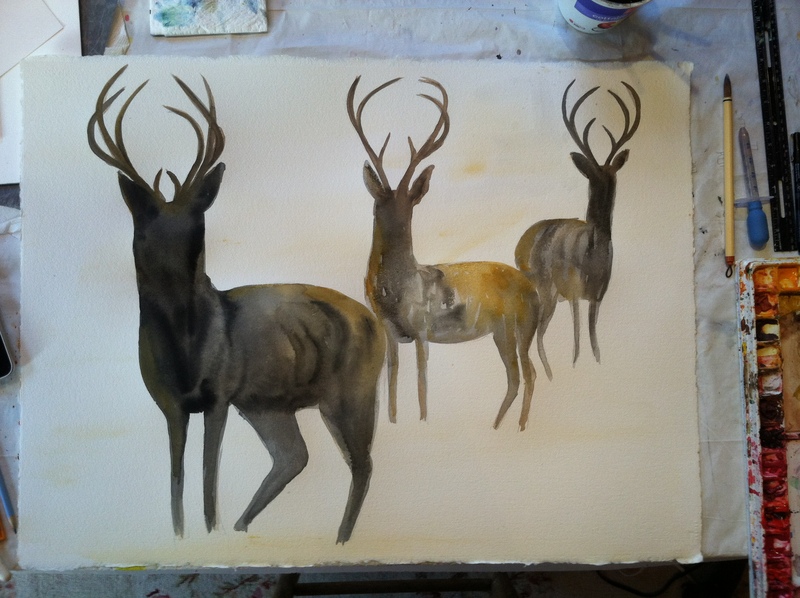 Art Prescription: I continue to try and paint bucks. My challenge…to capture their essence, and stay loose and gestural. This is on big 22.5 x 30 paper, so I used very wet watercolor and big brushes. I even did the faint background with a house-paint brush. It’s fun painting BIG!! And a nice break from launching The Art Prescription Deck: A Dose of Coloring Inspiration – I’m picking up samples Monday, whoot!! 10-point?? that was a big boy! Just to clarify…5 on each side is 10 points, isn’t it? I’m not up on these terminologies. LOL! So majestic Beverly, I love this painting. Also, thanks for the link to your botanical coloring pages. What a great idea. Beautiful work. Thank you Sharon. I’m supposed to be getting samples for my coloring deck today!! I’m in full launch gear and excited to share. Do you have this available on your Etsy, Beverly? Good morning, I haven’t listed it. Was going to once I had several. It’s a large painting 22.5 x 30. Are you interested in a buck painting? If so let me know what size and what kind of pricing you are looking for. Thank you, they are magnificent creatures. You can email me privately at bev@beverlydyer.com with the above. Thanks Wendra! How are you? !